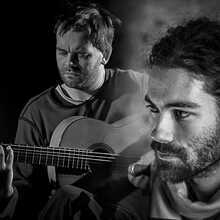 Myrddin has been thé flamenco guitarist of the low countries for over ten years and a much appreciated guest in De Centrale. With his album “Rosa de papel” he pulled open all registers and brought flamenco of the highest level, the highlight of his career for now. As son of one of the greatest musical talents in Belgium, Myrddin learned to play clarinet and flamenco guitar at a young age. What he learned from his father, he complemented with a classical education, after which he left for Spain to take classes with different flamencostars. Recently, he toured with ‘The Guitar Hero’, a marvellous tribute to Paco de Lucia. Nathan Daems is a Belgian multi-instrumentalist who plays amongst others saxophone, flute and ney, washint, kaval and Turkish clarinet. He is known of Ragini Trio, Nathan Daems Karsilama Quintet, Bazaar d'Orient, Antwerp Gipsy Ska Orchestra, Collective N Trance, ... but it is specially with Black Flower( on November 1, 2016 a sold out concert in De Centrale) that he skims high musical peaks. But he is also a bandmember with Myrddin and the two of them liked the idea of doing a duet at ENTR. Come in, sit down, eat something or drink something and enjoy these 2 nice musicians in a nice setting.